The Toy Fox Terrier is a very active and lively dog known for its hardiness. Though a small dog, 3 1/2 Ibs. to 7 Ibs., but Toy Fox Terriers think they are as big or bigger than any dog they encounter. They remain true Terriers. Their instincts for hunting can be confirmed by almost every owner of the breed. The breed is easily recognized with its distinctive head, with upright ears, set high on the head. The most often seen color is white/black/tan. The head is predominately black with tan eye dots and chops. The body is mostly white with or without black spots. Other colors are white/black and white/tan. The coat is short and glossy. The body appears to be square and has a gay tail that is set high and docked with about 3/5ths taken off. What tail that is left is usually in constant motion when excited or just happy. The dog at left is Ch. "PR" Hopkin's Fashionette a fine female from Eliza Hopkins’ Kennel. The Toy Fox Terrier is quite intelligent, alert, loyal and fearless. Many have been trained in Obedience, or as hearing dogs, circus dogs, and service dogs. Others are regular visitors to nursing homes, bringing joy to each and everyone they visit. They may come is a small package, but they are active all their lives. After having one, you will want another. 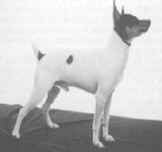 The Toy Fox Terrier of today is an all American breed. The breed was bred down from the Standard Fox Terriers here in America, but the TFTs roots have been traced back to the smooth Fox Terrier in England. Dr. Sally Reed of New Mexico did quite an extensive study tracing dogs in the U.K.C. pedigrees back to well known dogs of England. Sally traced the pedigree of National Gr.Ch. "PR"Yancey's Rinebold Skipper (born 2/24/67) back through seven generations of sires to "PR" Mil­Bees Bim (Bim was registered U.K.C. as a Fox Terrier ‑smooth). One of Bim's seventh generation ancestors is English Ch.Darrel; Darrel is ten generations removed from Foiler (Old Foiler) 1871. Foiler was the first Fox Terrier to be registered in 1875 or 1876 by the newly established English Kennel Club. Also included in these lines is a dog named Ch.Ttarb the Brat (born 12123/78) whose ancestors are the foundation to most modern day Smooths. All this information is in Bloodlines Jan./Feb. 1992 written by Sally Reed. Those helping with the tracing of the pedigrees where Dr. Sally Reed, Mrs. Eliza Hopkins, Dr. Myles Notaro and Ms.Carolyn Cook (of U.K.C.). This is Nat. Gr. Ch. Gorden’s Shamrock Lad, owned by Doug and Betty Gorden, of Crosby, Texas. He was the first TFT to twice win the National title. Through the years, breeders have strived to maintain the Toy Fox Terriers' sleek good looks, brains and temperament. The standard has changed through the years to clarify certain points for the newer breeders so they too can maintain a good conformation dog that has it all. The latest Breed Standard was revised in 1992 by a committee appointed by the National Toy Fox Terrier Assn. It was then approved by the National and UKC, and put into effect January 1, 1993. So, if you are looking for a nice lively dog but not looking for a lot of grooming and other expenses, these pocket size dogs may be for you. Contact the National Toy Fox Terrier Assn. for a Breed Club near you or UKC to get a breeder's list or more information. If you would like to read more about the Toy Fox Terrier, OTR Publications has a book The Toy Fox Terrier written by Eliza L. Hopkins and Cathy J. Flamholtz. Another book is Toy Fox Terriers written by Sherry Scott published by TFH Publications, Inc.